We were very fortunate and blessed to have been able to secure four (4) excellent birding guides for various ports of call on our Panama Canal Cruise (Celebrity Century). 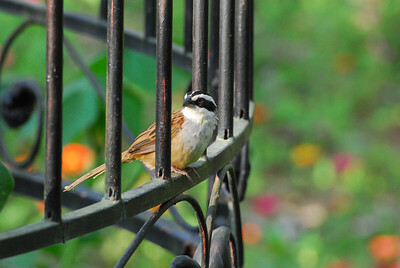 Some ports of call were half-days (Mexico) and others were full days of birding (Costa Rica and Panama). The birding adventures made this Cruise very memorable and the birding were the highlights of our trip. Not only we were able to get off the beaten path and see the Natural Beauty of our ports of call, but we learned more about the areas we visited and gained a greater appreciation for the diversity of this wonderful world, known as Gaia. Seeking a guide on Christmas Eve was a wee bit challenging, but then Alejandro Martinez of “Birding in Mexico” answered our inquiry and was very gracious enough to take time away from his family on this special holiday to guide us birding in this port of call. The timing of this port of call was not the greatest for birding – we didn’t arrive in to the port until 1 pm (when birding usually is coming to an end) – but Alejandro remained hopeful that he could still find us some nice birds during our short stay in PV. As we entered the Bay of Banderas (11 am to 1 pm), we had lovely views of several humpback whales (from Islas Marietas and onwards) with loads of pectoral fin slapping, social activity in groups of 2 to 5 individuals. Along the way to Port, several pelagics were observed from the ship, including the great Blue-footed Boobies that I feel are just awesome birds! I love the entire Booby group, but the blue-footed are simply awesome! We met Alejandro (Alex) just outside the port area where he greeted us with an excellent pamphlet book, “The Birds of Paradise” which not only offered great information, but also served as our “checklist” throughout the day. Alex first took us to “Conchas Chinas” for some spectacular birds! 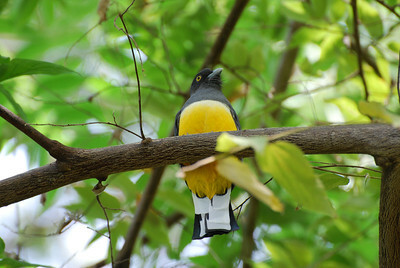 My personal favourite was the Citreoline Trogon – a stunning, stunning bird! 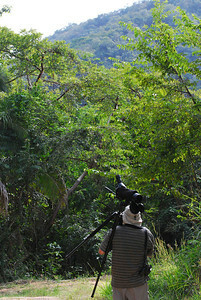 A special treat in this area was when six (6) endangered Military Macaws flew over our heads. This was my target for this port of call and during our first stop, we saw them! A highlight – one of the best of the trip! From Conchas Chinas, we ventured off to Mismaloya (Night of the Iguana fame), to the banks of the Tomatlan River and our final stop was to the Vallarta Botanical Gardens. The Gardens was an excellent way to finish our day and we were treated to a Cinnamon Hummingbird proclaiming his territory, chasing off Broad-billed hummingbirds as we sipped some refreshing drinks! I highly recommend the Gardens as a great spot for Birders trekking out on their own. The grounds are spectacular and several birds were seen, even at the end of the day. The gardens are also easily accessible from the Cruise port via YELLOW taxis. Alex was a really great guide, spoke excellent English, passionate about birds and the area and we really had a fantastic time with him.